This month’s guest blog is by Nicolas Olivier, a musical and digital educator. In his blog he’s focussed on using Skoog in a psychomotricity environment, using Skoog as a supportive tool for children with attention problems and short-term memory issues. The Skoog is an innovative musical instrument. Its unique form has nothing to do with the form of a real instrument, which makes it very interesting. Due to its form its original and attractive, and it’s colours make the children immediately want to touch and tap it. The enthusiasm that it created makes me imagine the pedagogical uses it can offer, and as usual Skoogs go as far as the creativity of the teachers. There are many different uses of Skoog in education such as the interpretation of a melody based on five notes (bass line, riff etc), a study of the pentatonic scale, creation of melodies, improvisation along with music, sound creation using mixing apps, and interpretation of rhythm. Its full integration with iOS makes it a very compatible tool because you can play with multiple apps such as GarageBand and all apps that support MIDI. A first exploration offers the child a freedom of sensory discovery. Surprised by the soft texture and attracted by the colours, the children love to listen to all the different sounds. The child has to memorise a sequence of notes played and then reproduce it – the different sensory channels make it easier to work with. Spoken words can be added by naming the touched colours or counting the supportive number,. Humming them facilitates this same memorisation. Skoog involves manual and digital movements, and is sensitive to applied force. This allows the sounds to vary in response to more or less tactile stimulation. 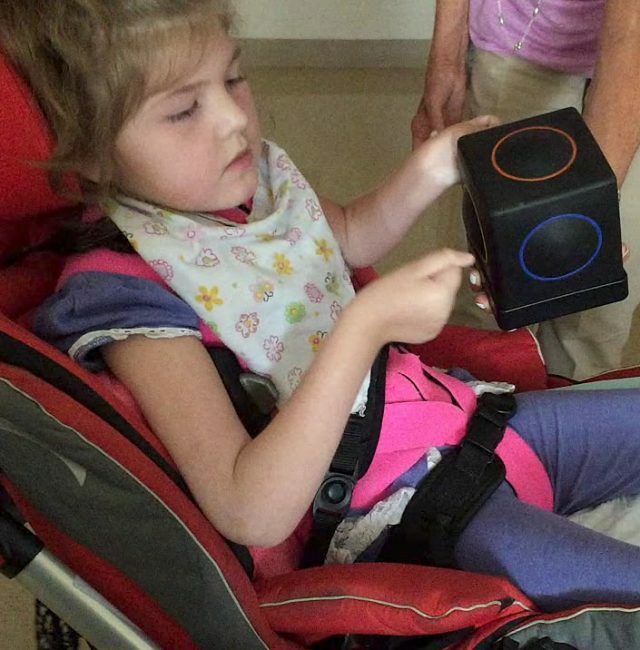 We found out that many children with hypertonia chose to work with Skoog. The hypertonia is often the cause of level of fluency in fine gestures, limited manual dexterity and digital untying and sometimes even disorders of writing. A toned work allows a better control, releasing certain movements, making them less difficult and less labour-intensive. Because Skoog is cubic-shaped and the semi-circles are positioned on each face, it offers different spaces to exploit. During the discovery it was interesting to observe the exploited spaces, some were hidden other weren’t. Theoretical notions on space can therefore be approached and immediately exploited and associated with sounds. You can observe the preferential hand of the child by looking at which hand they use to touch the buttons and so identify the dominant hand of the child. The notions of laterality can also be approached and used with Skoog. The Skoog is a perfect tool for psychomotor rehabilitation because of the many fields of work that it can be used for. It’s an attractive tool that kids enjoy using which facilitates their investment and performance in the work the would like to achieve. Here’s a wee demonstration Nicolas did of his own Skoog 2.0! To buy your own Skoog 2.0 head to the Apple Store! Please note: the video below is for a French literate audience.